The Utah Mental Health Counselor’s Association is the local chapter of the American Mental Health Counselor's Association. UMHCA is attempting to unite with all other mental health providers in the State of Utah. Although UMHCA endeavors to bring recognition and acknowledgements to Licensed Clinical Mental Health Counselors, specifically, we also desire to declare our alliance with all other noble professionals within the helping field. Licensed Clinical Mental Health Counselors have unique and distinguished skills, which UMHCA wishes to have recognized throughout the general populace and professional communities. The Clinical Mental Health Counselor is a viable equivalent, with full parity, to other Mental Health Providers. The Clinical Mental Health Counselor seeks to educate and promote the future of Clinical Mental Health Counselors in the state of Utah, in accordance with its chapter's mandate. The Utah chapter of AMHCA and the Clinical Mental Health Counselors of Utah recognize and appreciate the unique qualities and perspectives of Licensed Clinical Mental Health Professionals give to the helping profession. UMHCA recognizes our greatest strength is in creating a unified voice in the State of Utah in order to advocate for our clients, our communities, our profession, and our professionals in our State. UMCHA aspires to help alleviate both our clients and our professionals from abuse, bullying, neglect, misunderstanding and all other impediments to care for client and care of the professional. We hope to accomplish this destination through education, legislature, and all methods legally bestowed upon our non-profit organization. Furthermore, UMHCA wishes to provide support to all mental health professionals to allow professionals to ethically practice, without unnecessary impediments, bullying or threats to licensure. Whether you are a Licensed Psychologist, Licensed Clinical Social Worker, Licensed Marriage and Family Therapist, a Licensed Clinical Mental Health Counselor, or a graduate student in one of the helping professions we encourage you to JOIN to ADD your voice to ours as we strive to advocate for client care and our profession and professional integrity. 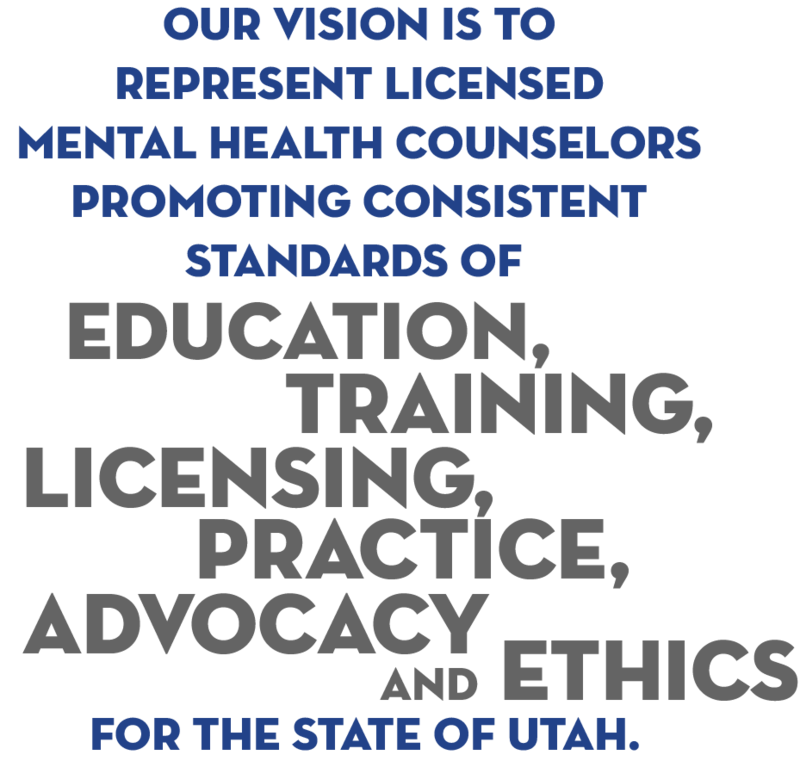 To enhance the profession of mental health counseling through licensing, advocacy, education and professional development in the State of Utah.